Friday was always a big breakfast day for us growing up. Well, it was more of a brunch day to be more specific and it always took place just before noon. My father was and still is our breakfast specialist. To him, and most Damascenes really, Friday breakfasts means a big table spread of many staple Damascene breakfast delights and a star dish or two. Some of my favourites stars that taste the best when made by him are layered falafel salad, foul (cooked dried fava beans), chickpea fatte bil zait or chickpea fatte bil badweh (which is made using the same technique I demonstrated in my rolled aubergine fatte recipe but instead with chickpeas and a different sauce instead), and, of course, his famous warm potato and egg salad. Warm potato and egg salad brings an instant smile to my face and sends streams of nostalgic yearning through my veins, with memories of my family gatherings, a lively crowded kitchen bustled with jokes, stories and laughs. As simple as this salad is involving just a handful of ingredients, it just bursts with a phenomenal flavour and taste. This salad is not strictly a breakfast dish; it can be served for lunch or as a salad alongside barbequed meats. Put your own touch and think outside the box. Don’t hesitate to experiment and add other vegetables and herbs if you fancy. Remember food is personal, so prepare it with the ingredients you love. As my father says, cooking has no rules, and I add: “just the technique”. * Wash the potatoes well and boil them in a pot of salted water with skin on until you can insert a fork with no resistance. Drain and set aside. * Bring another pot of water to a boil and add 1 teaspoon of vinegar (this will make peeling the eggs easier). Place the eggs in and set the timer to 5 minutes from when it comes back to boil. * Peel the eggs and potatoes. 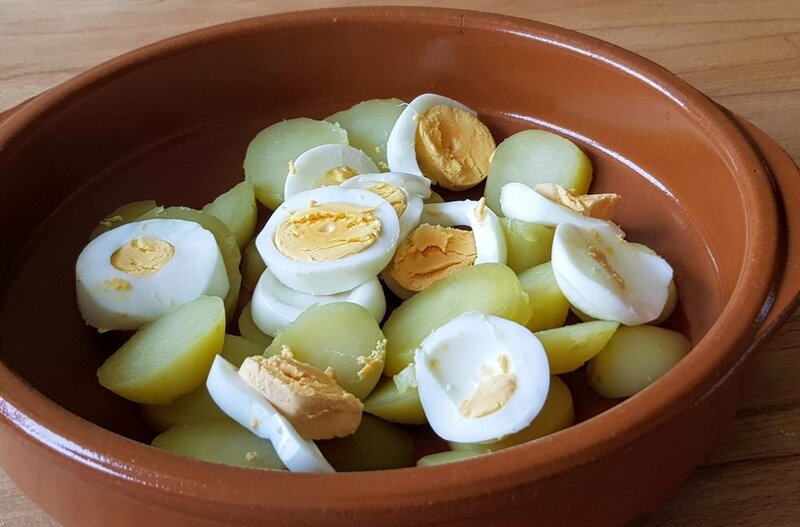 * Slice the eggs into circles and cut the potatoes to any shape you like as long as it is not too small. 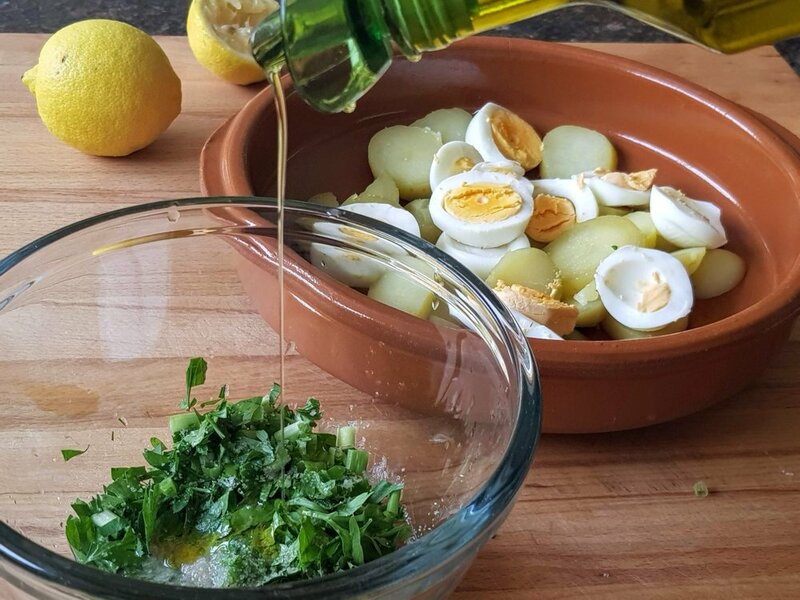 * In a glass bowl mix together the chopped parsley and green onions then squeeze the lemon, add salt, pepper and the olive oil. * Toss in the potato and eggs and adjust the seasoning and lemon to your liking. * Eat warm with pita bread or as is. * The easiest way to peel an egg is to tap it against the kitchen counter many times until the shell is cracked into tiny pieces then peel. * Wax potatoes hold their shape well when boiled but you can use any type that is available. Per Serving : 284 Calories; 19g Fat (57.7% calories from fat); 9g Protein; 22g Carbohydrate; 2g Dietary Fiber; 212mg Cholesterol; 85mg Sodium.